I guess the worries of a doting mom is normal. The dilemma is whether I show him I worry or I stay tough to prove I have confidence in his skill. Problem is, if I am too tough, he might believe I don’t care enough. Only one thing I am sure of — I always tell him how proud I am no matter what the results of his climb. For those who haven’t watched an actual wall climbing competition, they might believe it is a boring sport. It is actually breathtaking, especially when a climber is negotiating a difficult part of the climb. You actually hold your breath while he either jumps or maneuvers his way to the next hold. My son, being short, always has difficulty with holds that are too far apart. He actually leaps to the next hold if it is too far. Once his right hand gets a good grip of the next hold, he has to pull his entire body up with just his hand until his foot finds the proper support. His best climbs are from walls with very far climbing holds. I am almost sure the entire audience is holding their breath when he attempts one of his leaps. This is followed by tumultuous applause when he reaches the difficult hold and you can actually see this really small guy holding on to a tiny rock with just his right hand, his entire body swinging slightly, and he pulls himself up slowly to the next level. It is in speed climbs that they actually look like spiderman. 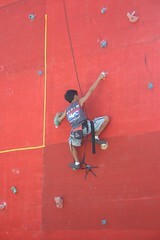 Two climbers compete beside each other with almost similar holds. The one who touches the final hold at the top first is the winner. My son can do a 20-foot wall in just over 13 seconds. During a national competition, he actually placed second, besting taller kids. Unfortunately, the champion was more than a foot taller than him but his time is only less than a second away from my son. I had never been prouder and I told him he is the better climber with all else equal. Try watching a wall climbing competition. It’s a different experience altogether. I believe it is one of those rare human capabilities that is pretty amazing.